The North Hills Holiday Shop is stocked for the holiday season and will provide a one-stop shop for all of your North Hills Indians item needs. 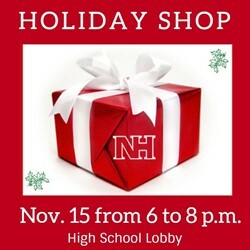 For one evening only, the North Hills Athletics and Activities Office will open to the public for after-hours shopping from 6 to 8 p.m. on Nov. 15. The office is located just inside the main doors of the high school. Cash and checks will be accepted. If paying by check, please note that separate checks are required for each booster club purchase. For more information, contact Chelle Zimmerman, North Hills activities coordinator, at 412-318-1438 or zimmermanm@nhsd.net.